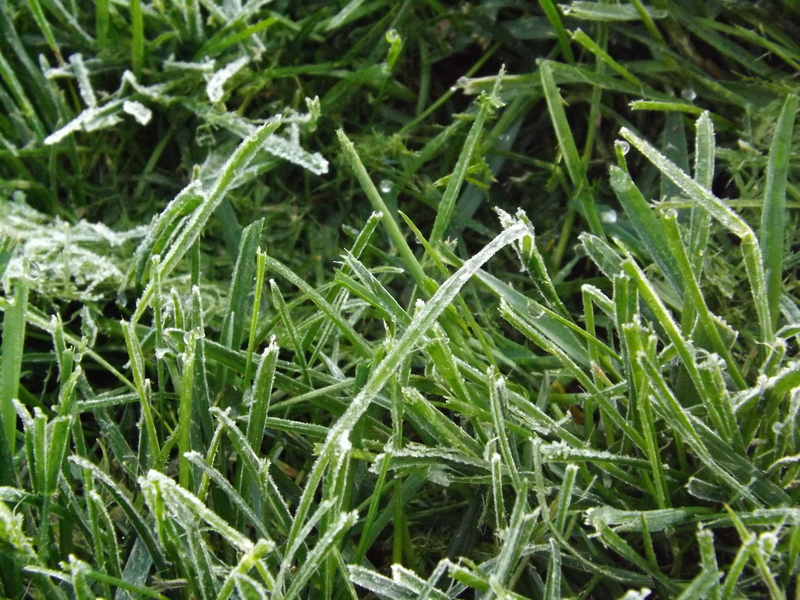 Preparing For Battle – Slugs Beware! Last year when I planted pepper plants on the side of our house, it took just a few days for the slugs to set their sights on the full, luscious foliage. 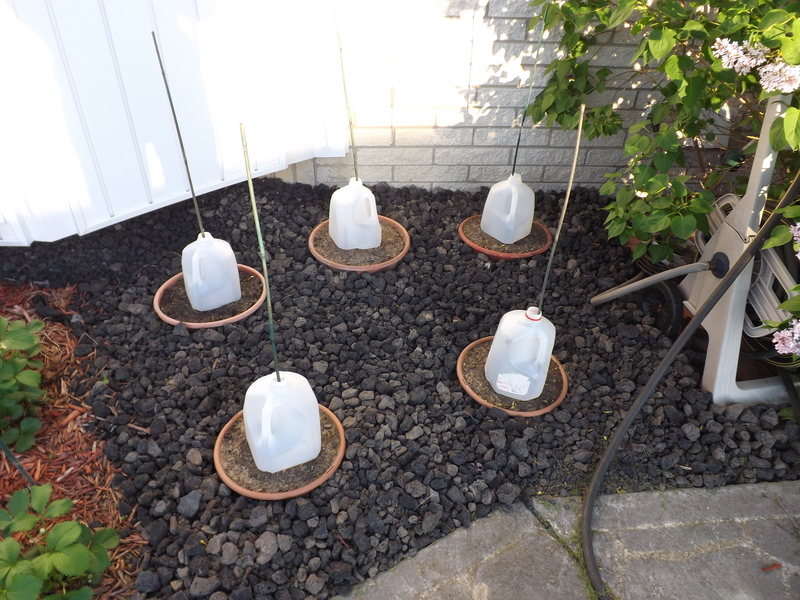 After some research and a little preparation, I was able to remedy the situation fairly quickly by setting slug traps before nightfall. This thwarted the Attack Of The Killer Slugs. 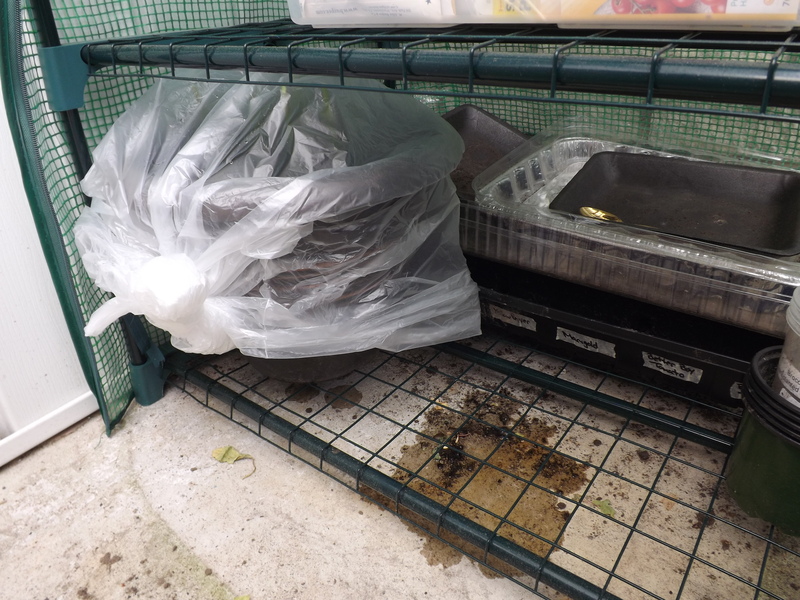 This year I decided not to let the slugs get the jump on me and began preparing my slug traps early. 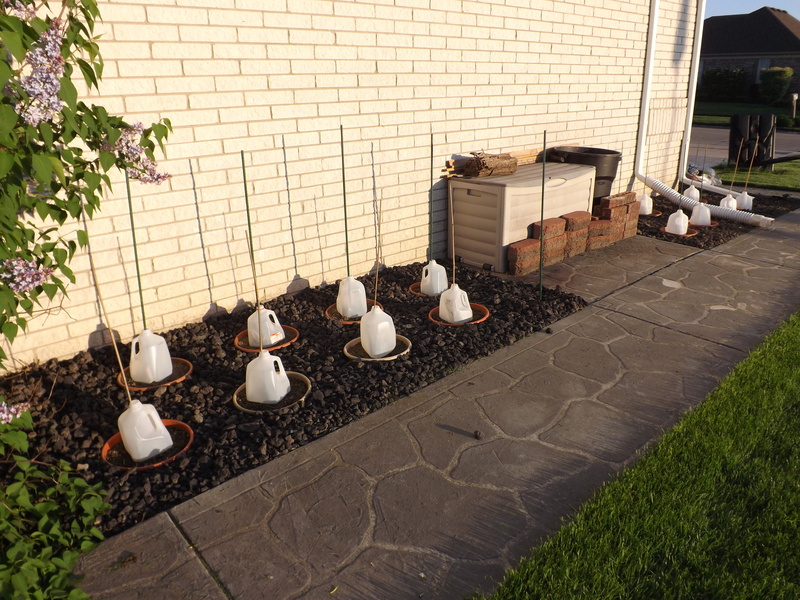 Even though my pepper plants are still small and not much of a temptation for the constantly present slugs, being that there are more than 40 plants this year, a far cry from the 4 I planted last year, a bit of preparation time is definitely called for. 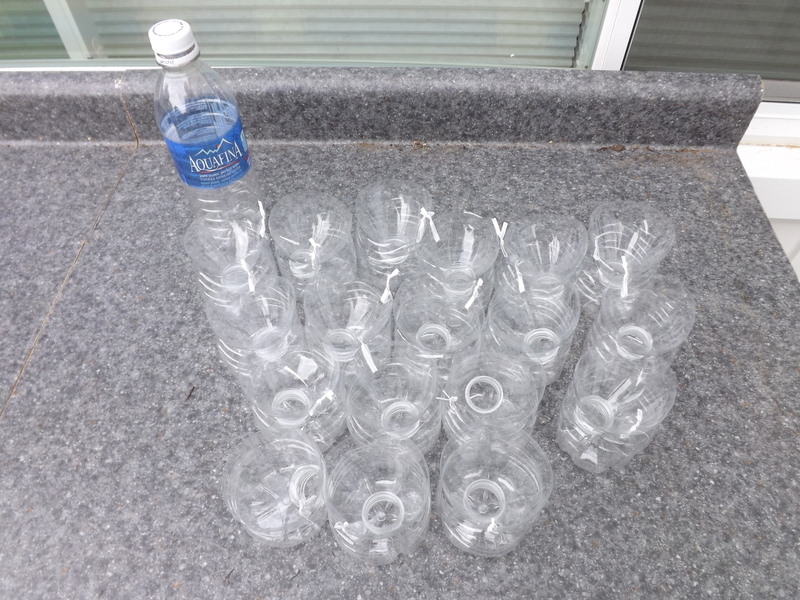 Here are the first 18 slug traps ready and raring to go. All I need now is some beer to bait them with and we’re good to go. Last year with just four pepper plants I was able to can enough jalapeno and green chilis for the year. This year I hope to harvest enough Romanian, Szegedi, and White Cloud peppers to pickle for the coming year, about two bushels. Any more than that will be great roasted with a bit of garlic, any less and it’s off to the farmer’s market to make up the difference. The slugs took me by surprise last year and nearly destroyed the few plants I had. This time I’m ready for them, and for this I am — Simply Grateful. 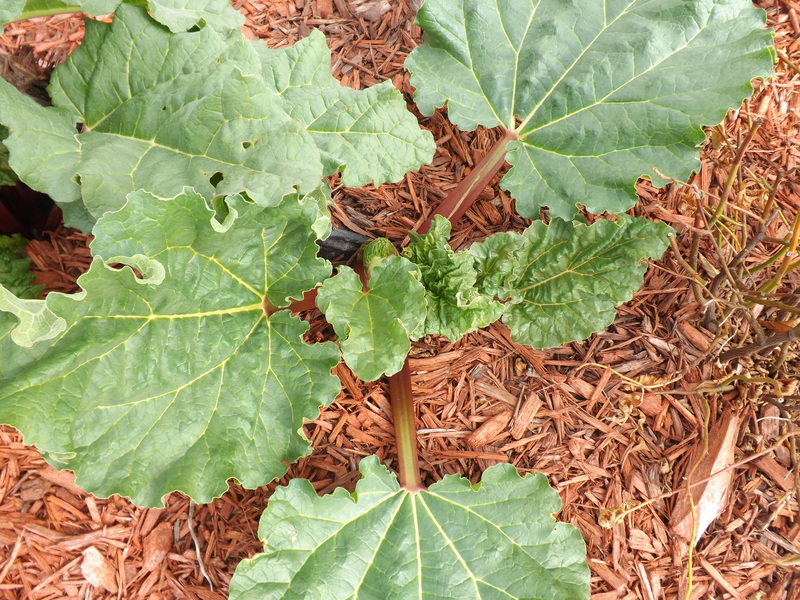 After my post on Monster Rhubarb!, I received several responses as to whether or not this was a good sign or the end of my rhubarb for the season before it actually began. I read up on it a bit, as I had no idea it wasn’t supposed to flower (or seed in this case) and found out all was not lost. 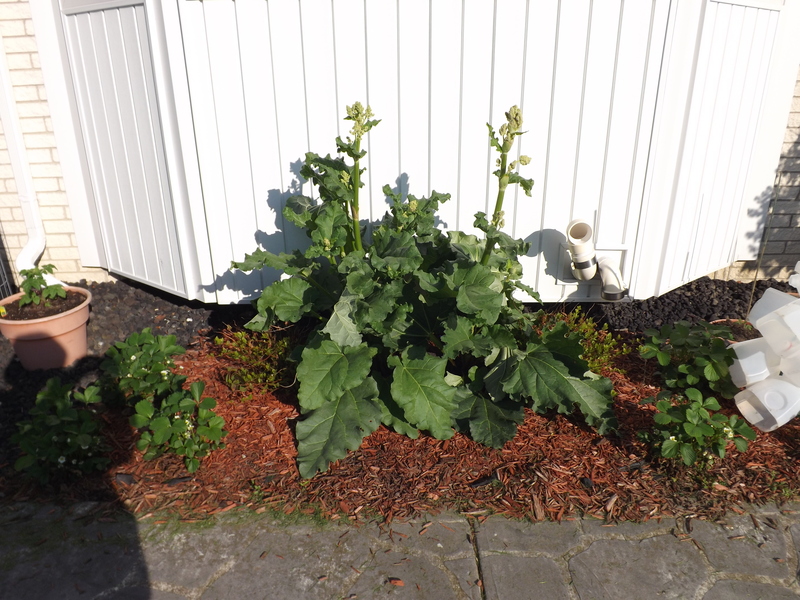 In order to salvage the rhubarb that was growing and to encourage new growth throughout the next month or so, all I had to do was cut back the flowers/seeds. Maturity: The older a plant, the more often it will go to seed. This is the second year for my rhubarb, so I doubt maturity was a factor. 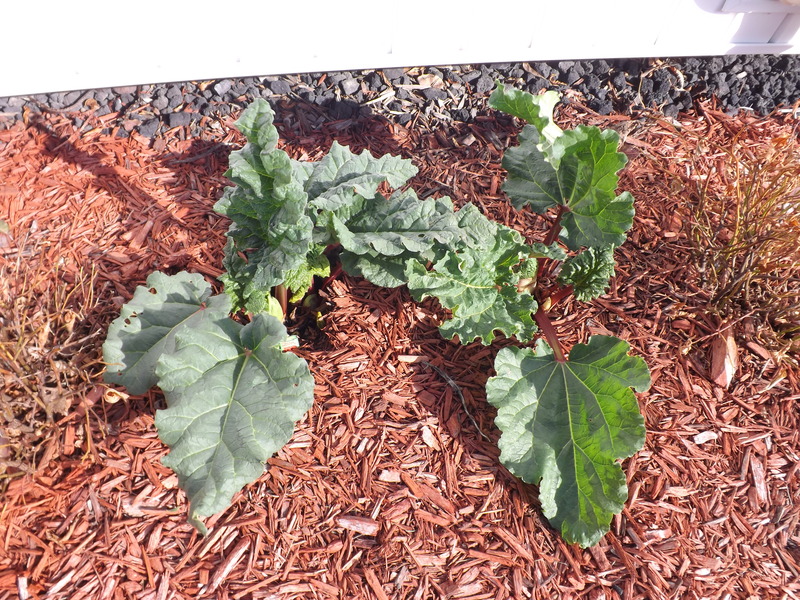 Variety: Certain varieties of rhubarb plants seed more often than others. I have no idea what type of rhubarb I have so this could be a factor, but who knows. Stress: If rhubarb suffers lack of water, animal damage, pests, or nutrient deprivation, it can cause it to seed. None of these were a factor with my plants. Apparently going to seed isn’t always a bad thing, because in my case it proves my plants are healthy. 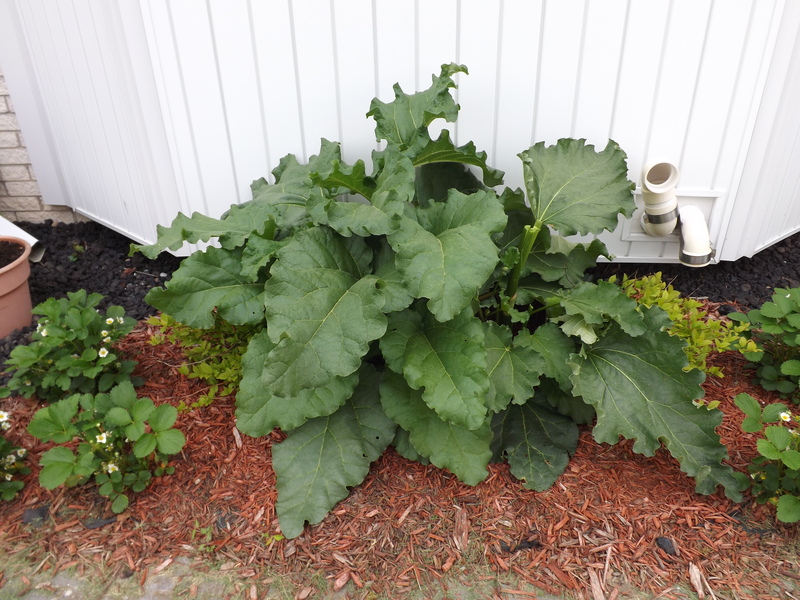 The reason I want to cut the seed stalks off though is because once it goes to seed, the plant stops producing new usable stalks of rhubarb. 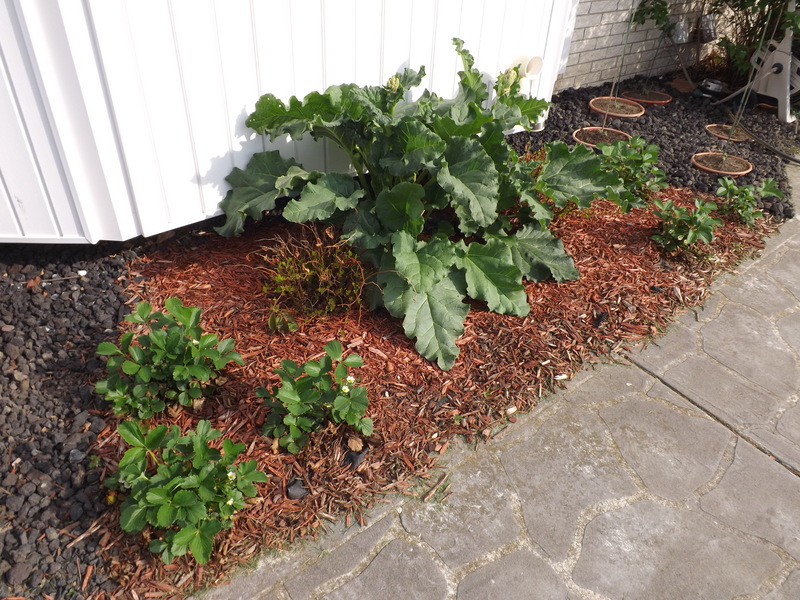 I’ll definitely be keeping a close eye on these plants for the next month or so just so I can get as much home-grown rhubarb as possible. 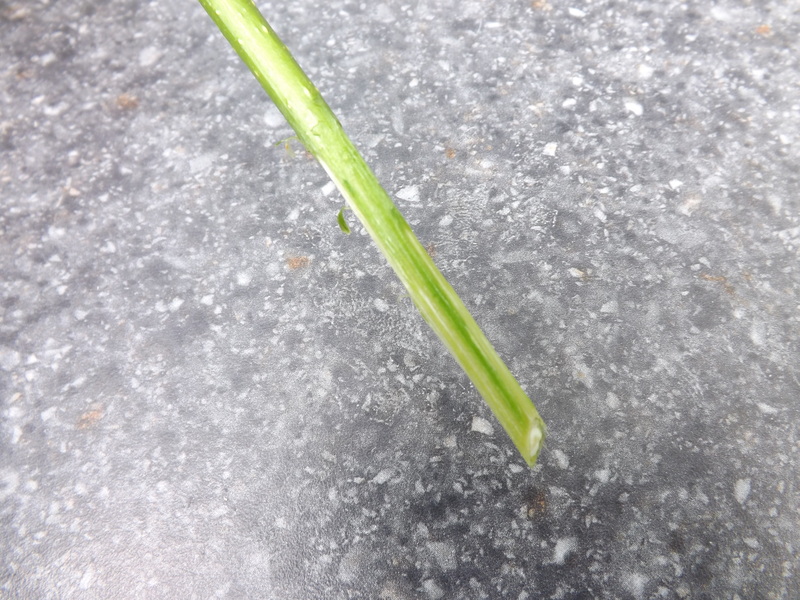 After cutting the flowering stalks back, a few days later there were again flowering stalks protruding from the plants. I quickly snipped these away. I love gardening and although I have a lot to learn, the learning process is one of the things I love most about it, and for this I am — Simply Grateful. Several weeks ago when my friend Suzanne stopped by for a visit, she asked if it was possible to start a lilac bush from cuttings. My lilac bushes were just beginning to bloom and she mentioned she had an area in her yard where a lilac bush would be perfect. I admitted I didn’t know, but didn’t think you could. Well, I was wrong! While commenting on one of my posts, Suzanne shared with me that she had found out lilacs could indeed be started from clippings. I took the hint and Googled it. The results were many. After watching several videos and reading articles on how to do it, I set to work. 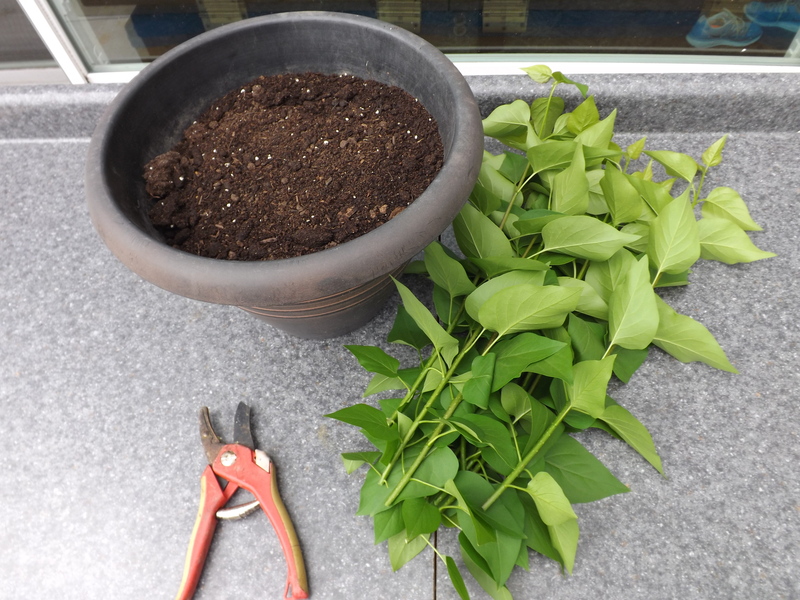 The first step in propagating a lilac is to either pull new plants that have sprung up around the base of the bush or to cut pencil thick new branches from the bush. 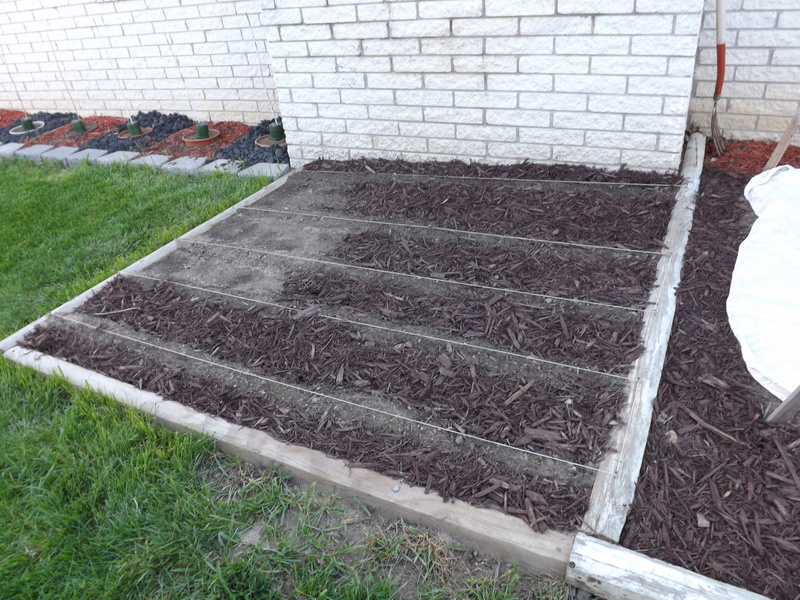 I tried pulling some of the new plants from the ground, but the root systems are too strong I could not remove the plants without completely destroying them. So I grabbed my pruners and cut ten new branches from the bush. 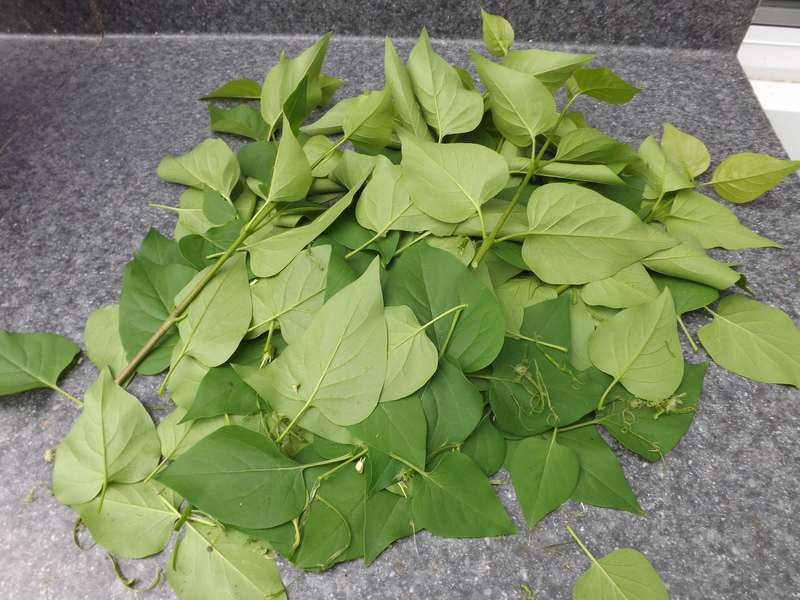 Next I removed all the leaves, scrapped the bottom of the stems to remove some of the skin to make rooting easier, and then recut each branch at an angle. 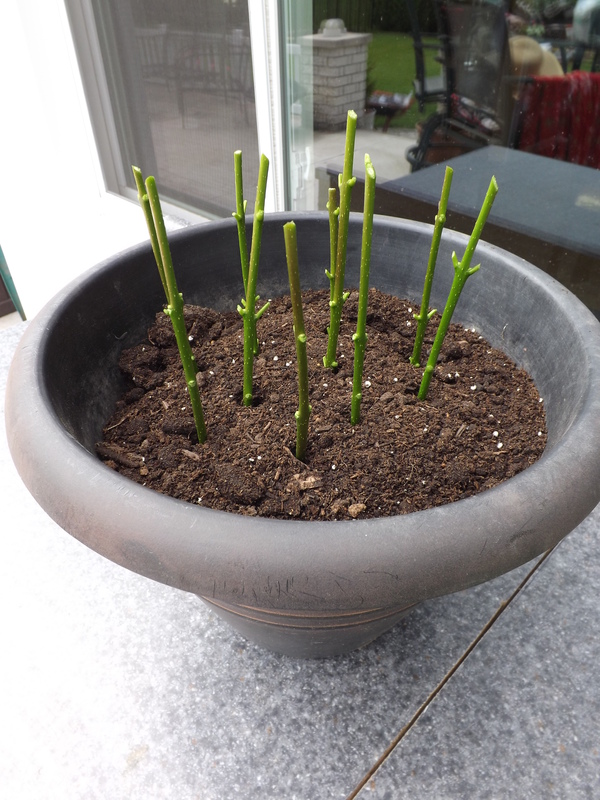 Once a branch was prepared, I pushed it into a pot of potting soil and watered the soil. 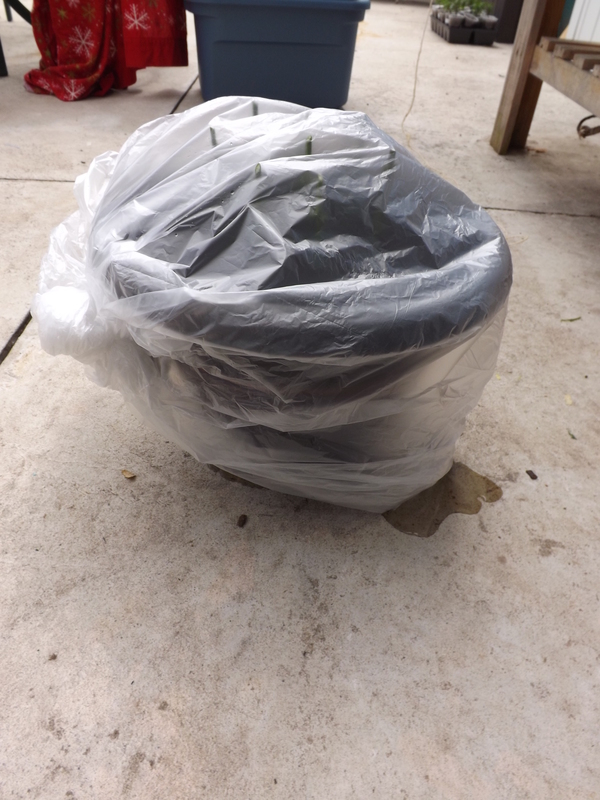 The final step in this process was to cover the pot with a plastic bag, giving the stems a warm, moist environment to grow in. I put the pot in my greenhouse, and now the waiting begins. 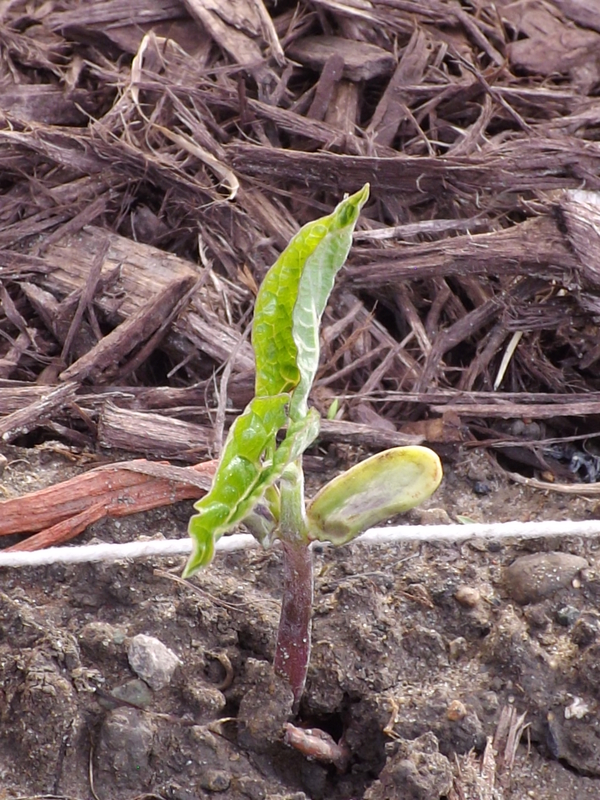 Supposedly it can take up to a year for a lilac bush to form enough roots for planting, but some signs of life on the stems should become visible in one to two weeks. 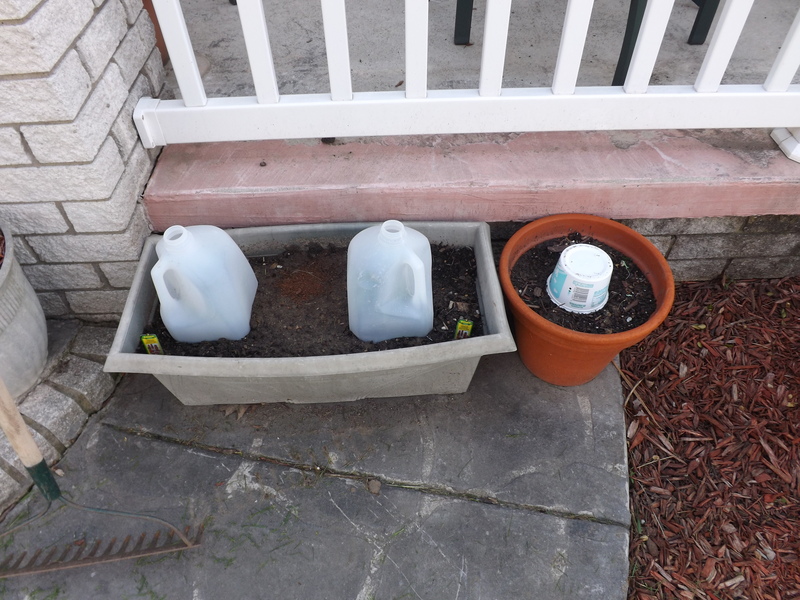 The only thing I’ll have to do until it’s ready to plant is make sure the soil stays moist. I have no idea how well this is going to work, but I love learning something new. Any time I can share something with a friend I’m thrilled, and for this I am — Simply Grateful. For the past two years I have planted bean seeds and been sorely disappointed. The first year none of the seeds sprouted and last year the few plants that did sprout, quickly fizzled and stalled, never producing more than a few leaves. 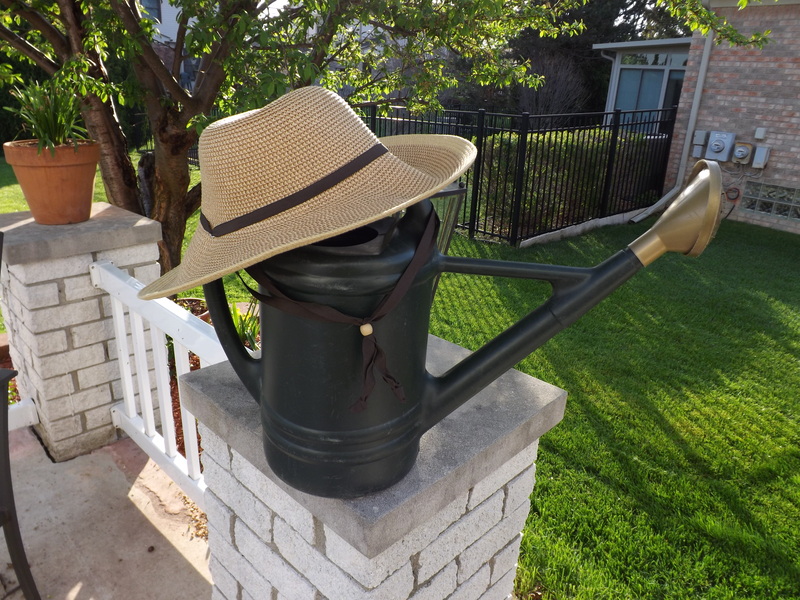 This year during the planning stages of the gardens, I did a lot of research as to why certain plants flourished in my gardens while others did not. It became apparent that “winging it” in the garden is not an option. Too many plants cannot produce or thrive when paired up with others. 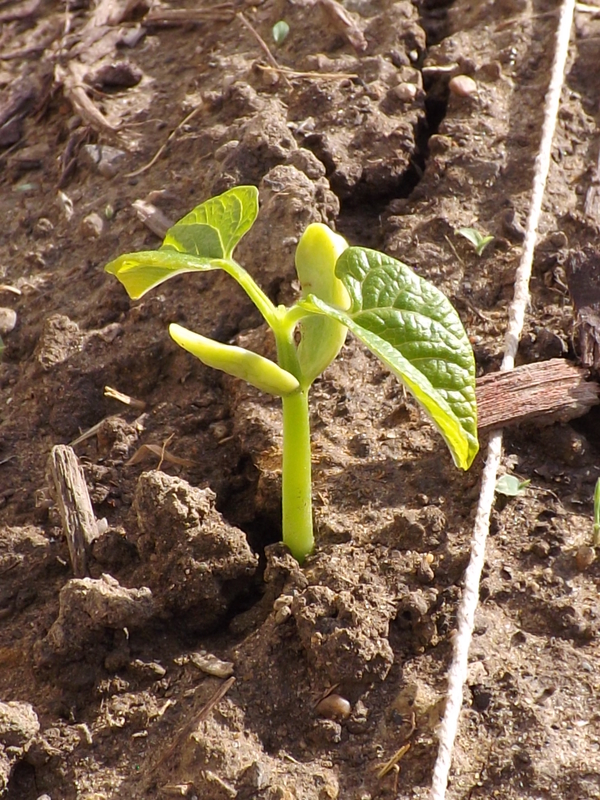 In my reading, I learned that beans especially are quite sensitive and that where I had planted them in the past, they were doomed to fail. The plants I had to stay away from were garlic, onions, and sunflowers. Peppers were also mentioned as a foe to beans, but the information I found was not consistent. Some sites said to avoid planting them together, while others said they could be planted together. As the gardens began to take form, beans were plotted for an entire section in the back garden, but seeing as nothing ever works out as written on paper, it ended up on the side of the house. Not only was this area far enough away from any contradictory plants, but it was next to the A-frame so now all the climbing vegetables would be together. There are some peppers along an adjacent garden, but my hope is that since they are not sharing the same soil and there is a section of grass between them, if peppers are a hindrance for beans, they will not be affected. 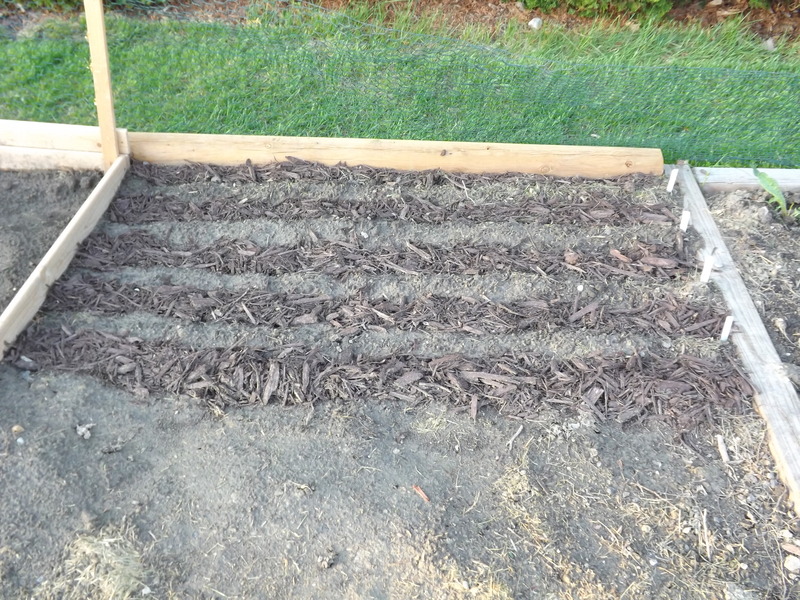 I planted two rows of pole beans and three rows of bush beans. After nine long days, I finally was rewarded with a sprout — a single sprout, but at least it was a sprout. By day fifteen however, nearly all the seeds had sprouted and they seem to be on their way. I’m not sure if these plants will make it long enough to produce any beans, but I am certainly going to keep my fingers crossed. 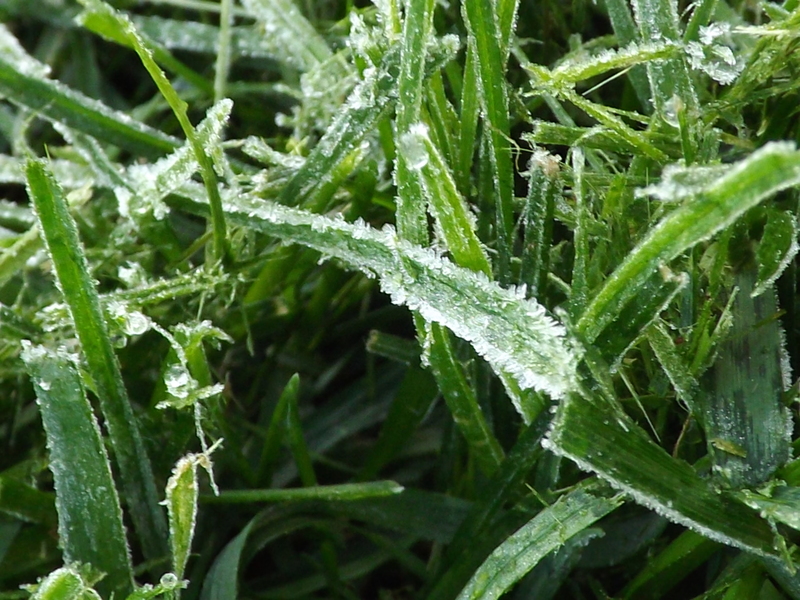 This morning I woke to frost, which had not been predicted. I got out before 6 a.m. and hosed every plant in all the gardens down, but we’ll see what happens. It is possible that beans are just not meant to be for my gardens, but for the time being I’m going to keep on trying, and for this I am — Simply Grateful. Many of the recipes in my repertoire have been inspired by dishes Hubby and I have eaten while on vacation or in restaurants. Although we don’t vacation or eat out very often, when we do we like to try foods that I don’t typically make at home. Back some 25 years ago we went on a Caribbean cruise. At that time my pallet was quite young and hadn’t experienced much of anything so practically everything that was served on the cruise was new to me. One dish that was new to both of us was carbonara. This particular dish was served as an appetizer one evening and after tasting it, both Hubby and I ordered a second helping and then Hubby a third. 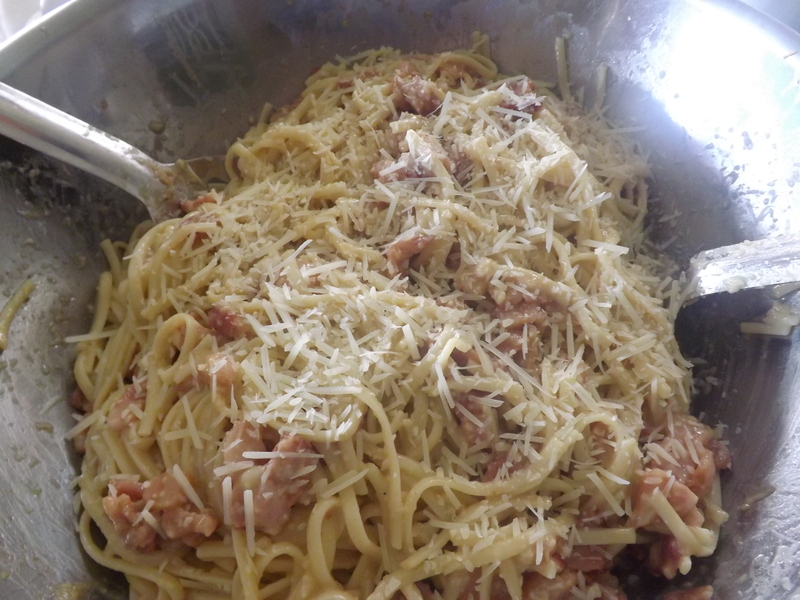 Even back then it was important to me to be able to make at home the dishes Hubby enjoyed when we went out, so when we returned from our trip, the search for a recipe for carbonara began. It didn’t take long for me to find one among the cookbook collection I had at that time. Now most of those cookbooks have had the recipes I liked in them scanned into the computer and the books themselves donated, but this particular cookbook is one of only a few I still have. The original recipe is what I consider “authentic” Italian cuisine and uses ingredients that I do not usually keep on hand and therefore won’t necessarily use. No matter what recipe I use, one rule of thumb I have is all the ingredients have to be something I would normally use. I don’t want to buy a bottle of high-priced vinegar that will be used in only one meal perhaps two or three times a year. My version of a recipe like that would have to either be tweaked so I can substitute something I already have on hand, or I would have to find other recipes that would share the specialized ingredient so I can justify the purchase. 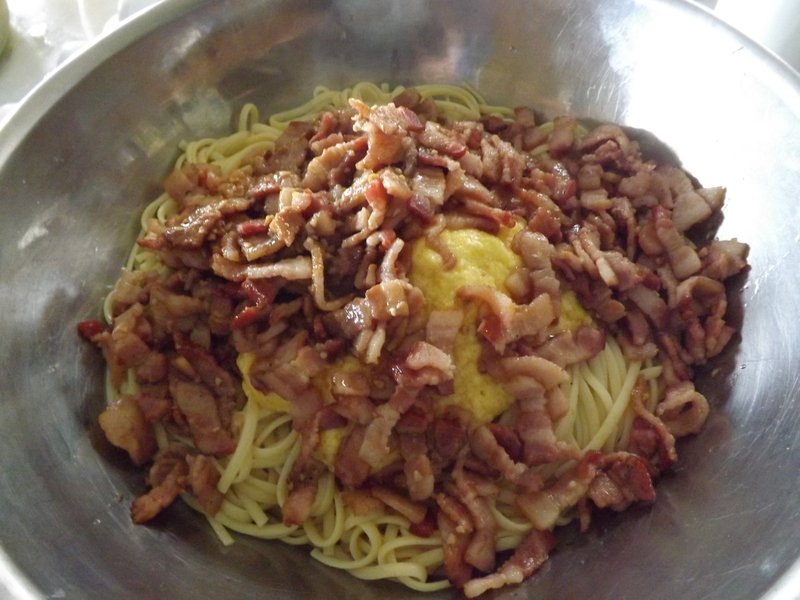 In carbonara, one ingredient never on hand in my house is pancetta – Italian bacon. The first time I made the recipe, I did go out and buy this bacon, but not only found it too salty, but too expensive for my budget. Since then I have found using thick cut, smoked bacon serves this dish well for several reasons. First and foremost, taste. Hubby likes this dish so much that I serve it as a main course. 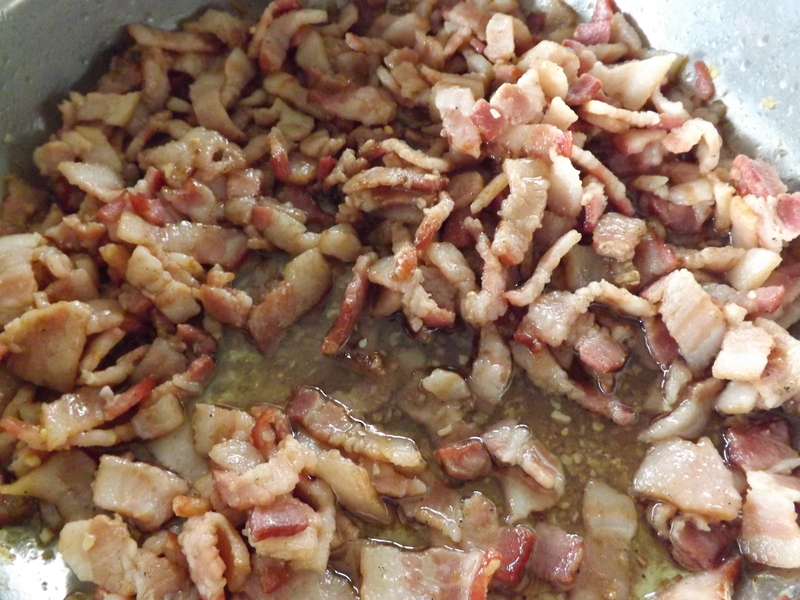 Using the thick cut bacon which is not as salty or expensive as the pancetta, I can use more of it to make the dish hearty and filling and not worry about it being too salty. Second, price. Although bacon is expensive, thick cut smoked bacon is at least half the cost of pancetta, and more likely a third of the cost of a good pancetta. And third, convenience. I always have bacon in the freezer. Hubby likes to have bacon for breakfast at least twice a week, so whenever I need a quick and easy meal on the fly, I know there is bacon in the basement freezer to cover me. Another ingredient in carbonara that I don’t always have on hand is dry white wine. This is an easy fix and actually kind of a fun one. Several times when preparing this meal I discovered halfway through that I didn’t have any dry white wine or any white wine at all. Scavenging through the cabinets and fridge I came up with red wine. Using this not only worked, but gave the carbonara a different flavor. This led me to trying various types of wines and the results have always been wonderful. Probably our favorite is to use a dark red wine because it gives the dish a pretty red hue and the flavors are more dense and complex. Heat oil in skillet over medium-high heat. Add garlic and saute until fragrant. Add bacon and fry until lightly browned. Add 1/3 cup wine and simmer until almost evaporated. Add remaining 1/3 cup wine and turn burner to low and cover. Beat eggs lightly. Stir in cheese. Cook pasta. Drain. 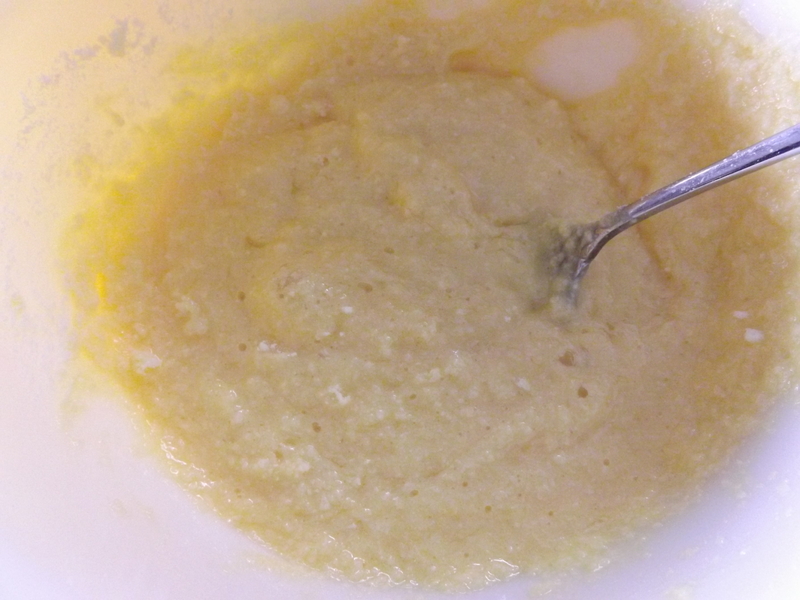 Add egg-cheese mixture and hot bacon mixture and toss well. Top with some freshly grated Parmesan cheese and serve immediately. One thing I have learned over the years is that being flexible is a necessity in the kitchen. Had I not tried a different bacon in this dish I might not have continued to make it and had I not experimented with various wines, I never would have discovered that just because it calls for “dry white wine,” doesn’t mean you HAVE to use “dry white wine.” This isn’t rocket science, and for this I am — Simply Grateful. 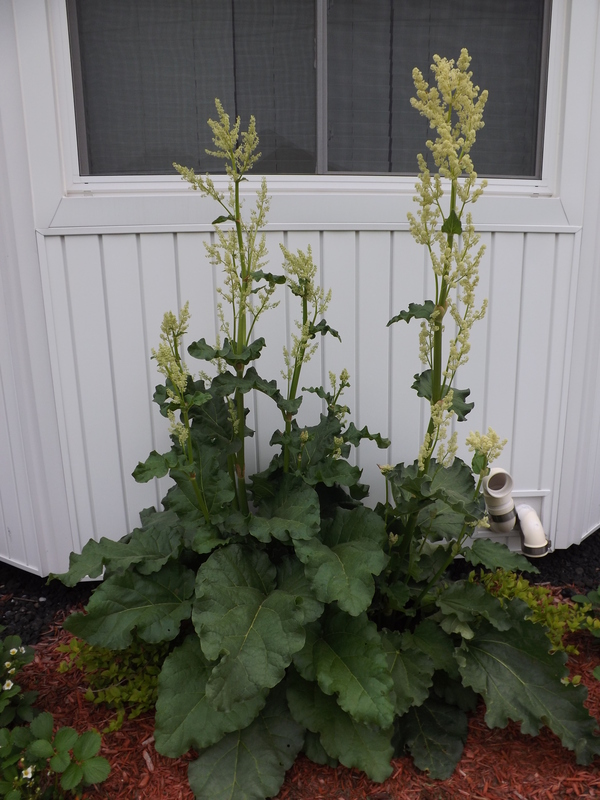 Last spring I planted two little plants of rhubarb on the side of the house, hoping that in a year or two I’d have enough rhubarb to harvest for canning. At this rate, it should be taller than house by the end of June. Looks like there will be rhubarb for canning, and for this I am — Simply Grateful! Another glorious Michigan morning. The sun is shining, the garden fared through the night, the birds are singing — it doesn’t get much better than that, and for this I am — Simply Grateful. Gotta love Michigan weather! 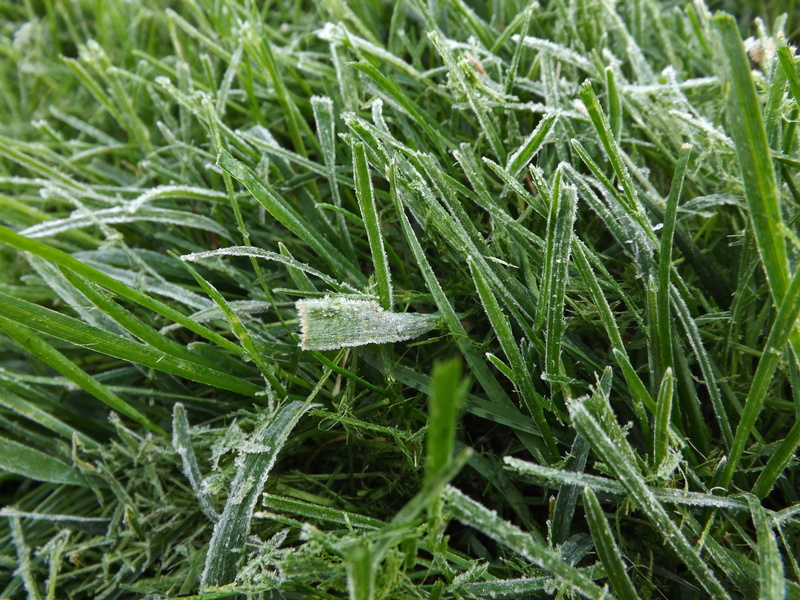 So, it’s the middle of May and yes, frost is predicted for tonight. 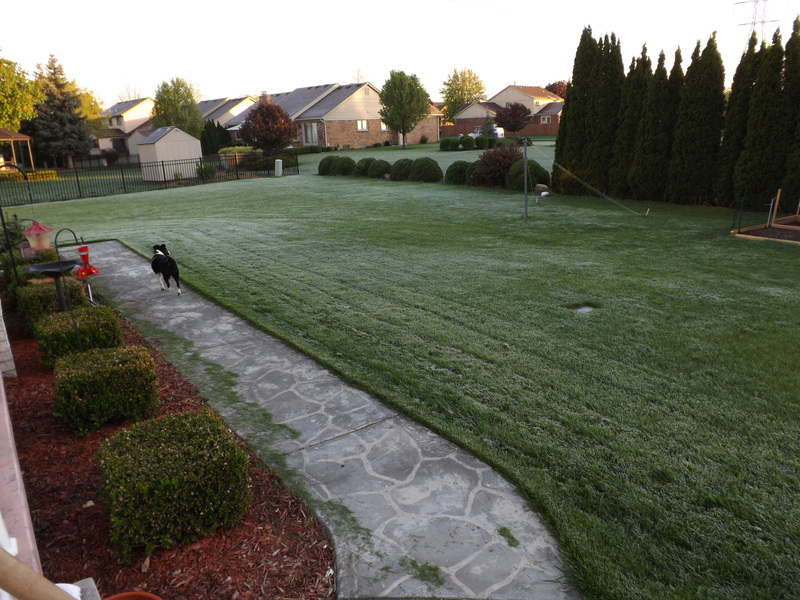 So much for the Farmer’s Almanac which predicted the last frost for my part of Michigan to be May 8th. 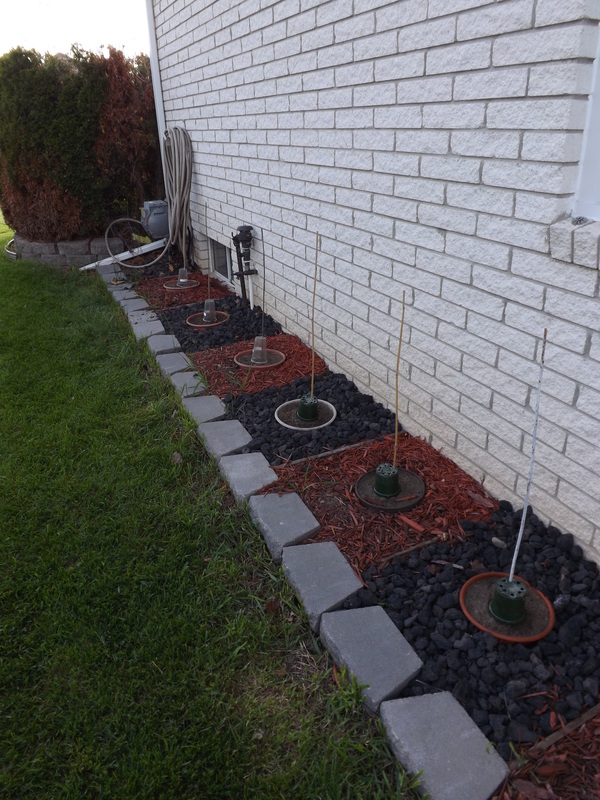 Now I get to do my best to cover all the plants I’ve dared plant in the gardens so they don’t shrivel up and die. 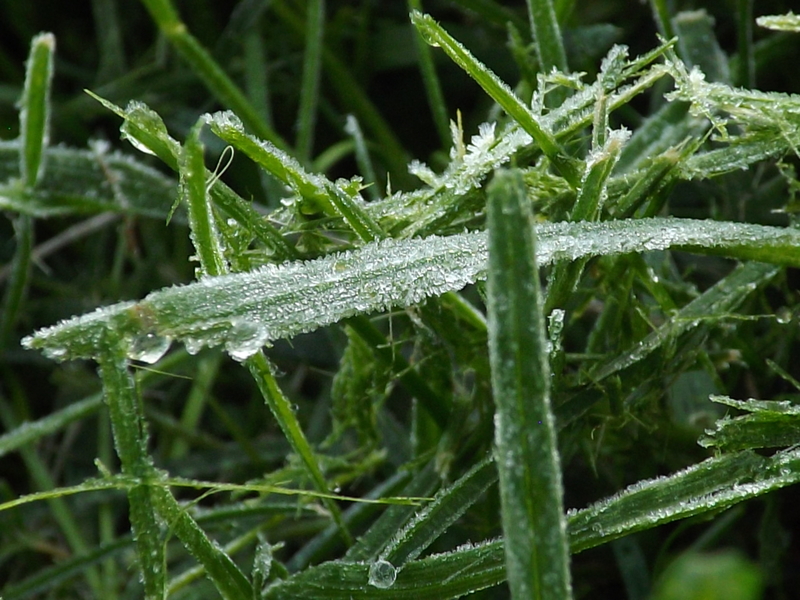 The pepper plants on the side of the house aren’t doing so hot as it is, so even the slightest frost would probably do them in. 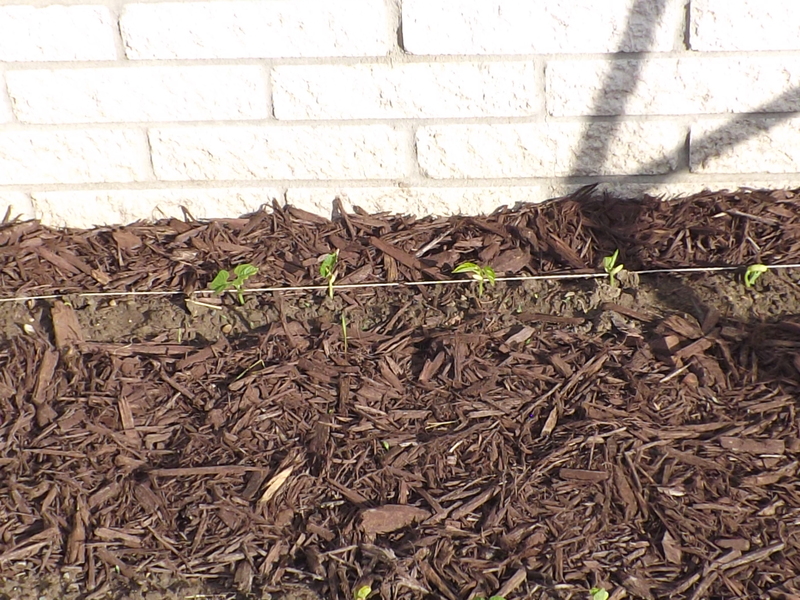 As for the tomatoes, well they seem to be taking pretty well to their new home on the west side of the house and are thriving in all the wonderful afternoon sun they’ve been getting. These are all going to be covered tonight. 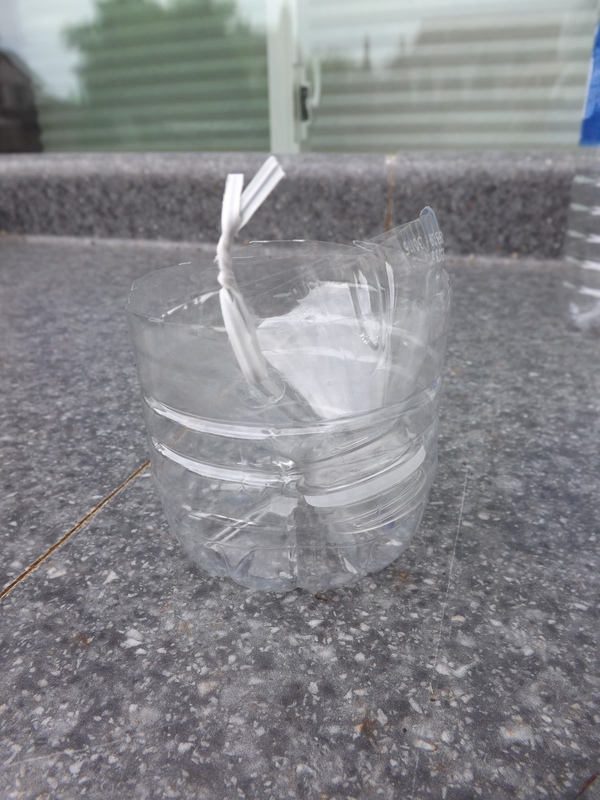 Thankfully I have just enough milk cartons to get the job done. 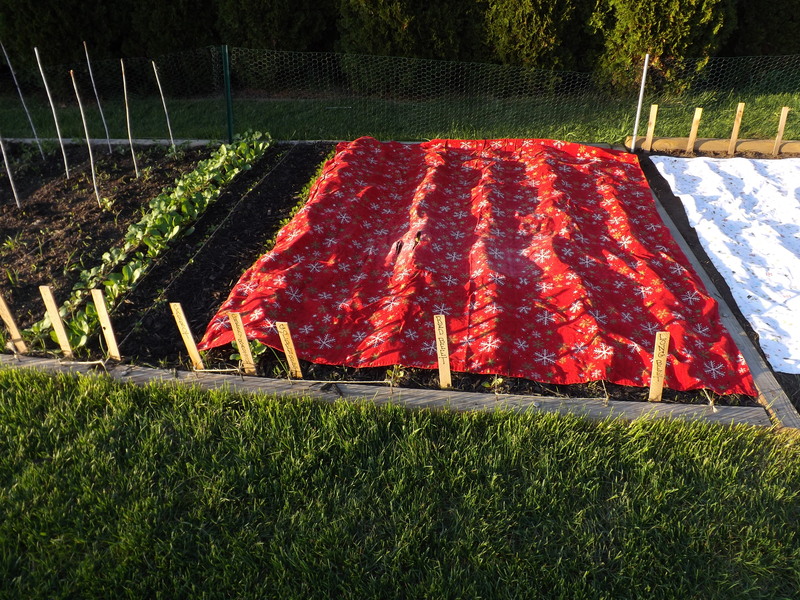 The cucumbers, spinach and kale are covered with a sheet. I hope this insulates them enough through the night. 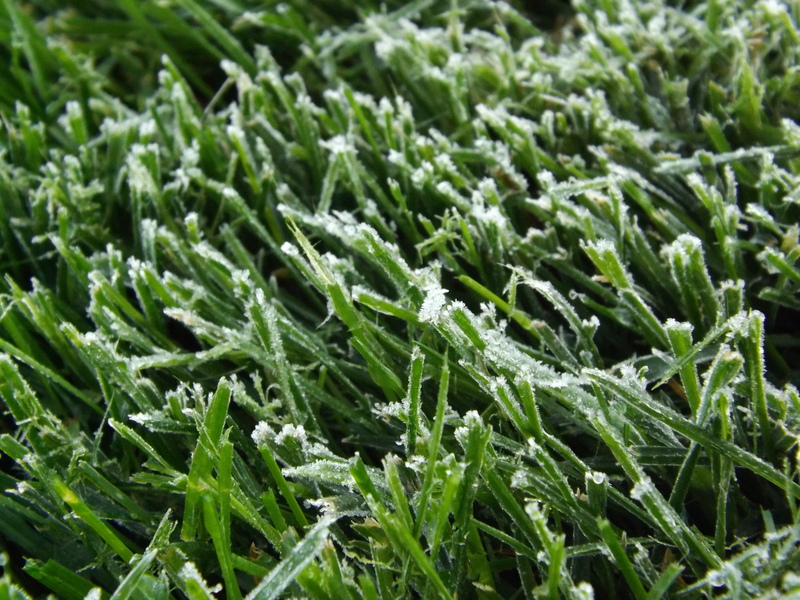 I’ll be out first sun to make sure nothing moved during the night so I can water them down if frost sneaks under there. All of the corn popped up as well as the new pumpkin seeds I sowed directly in the soil, so these too are covered with a sheet. 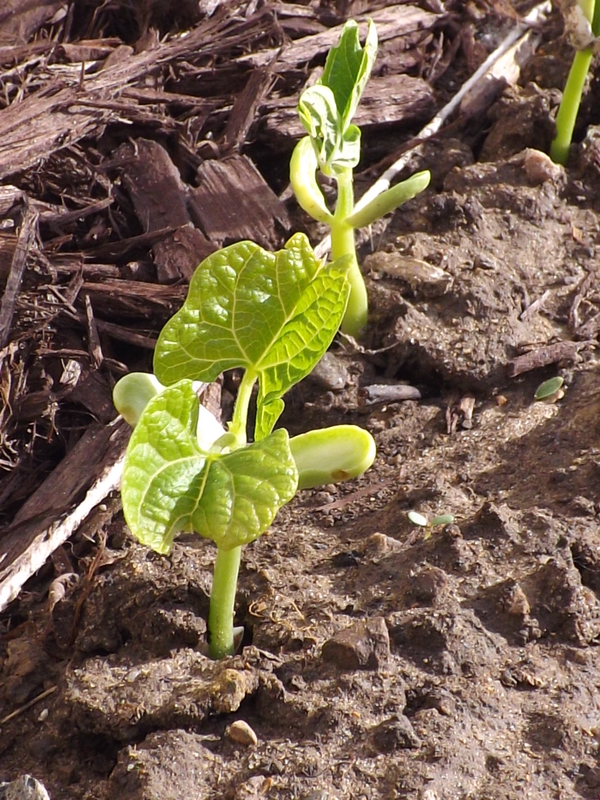 They came up fairly quick so even if they do get hit by the frost and stall, I will most definitely replant. I don’t want to have to do the work, but at least I’m early enough that I have the time if needed. 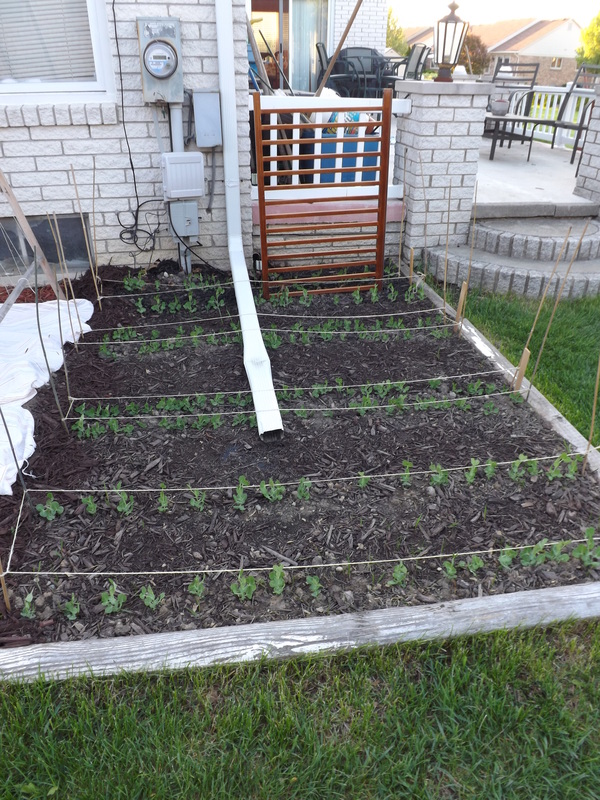 As for the peas, they should be okay and be able to tolerate the frost, so they are on their own. I was torn when it came to the root garden. 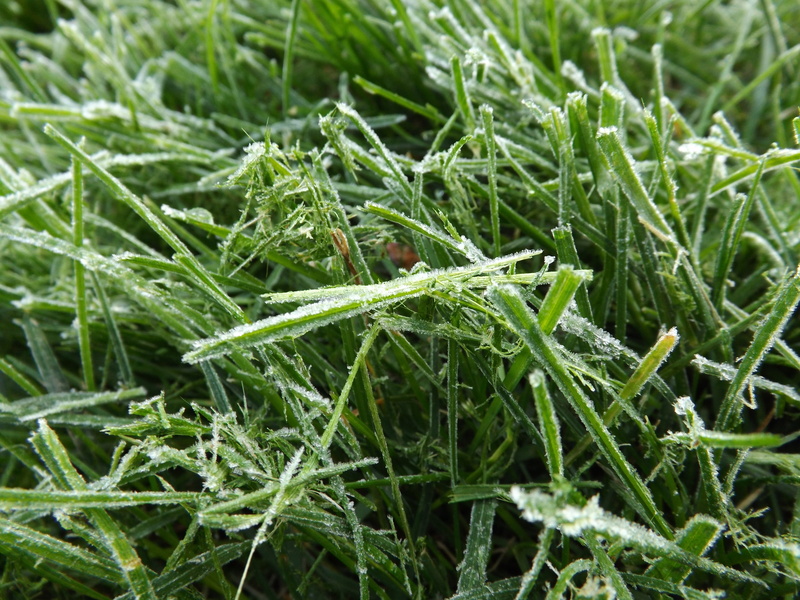 Although the beets, turnips, radish, carrot, and parsnip all grow better in cooler temperatures, I’m not sure they would survive a hard frost. I covered them too, just to be sure. I’ve spent a lot of time sowing the seeds, weeding, and thinning these already this year and do not want all that effort going to waste. 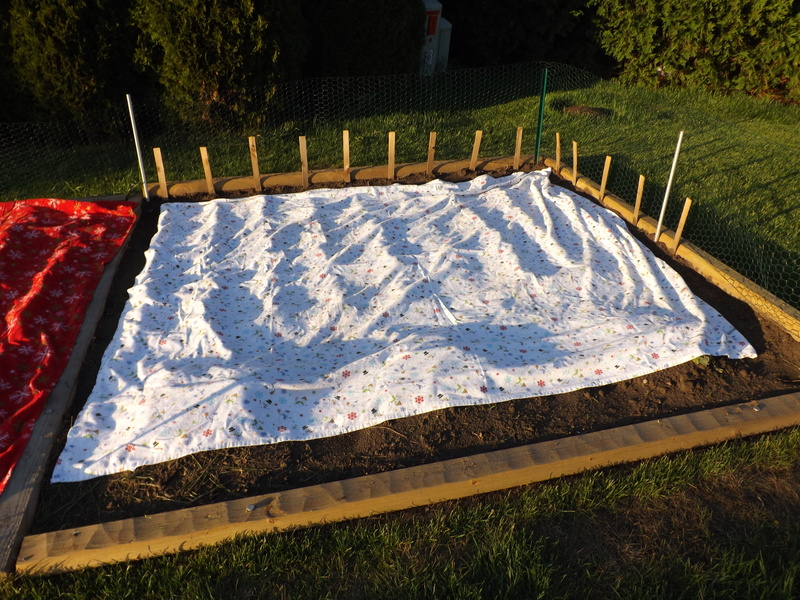 The sheet was too short to cover one row of radish and the turnips. I’ll get out in the morning with water if need be for those. 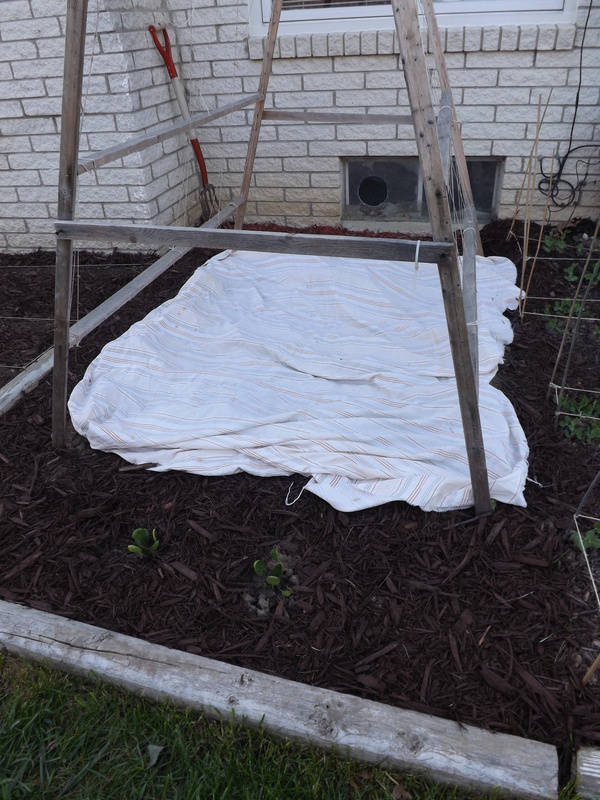 I didn’t cover the garlic or the bean gardens, as neither of these have sprouted yet. 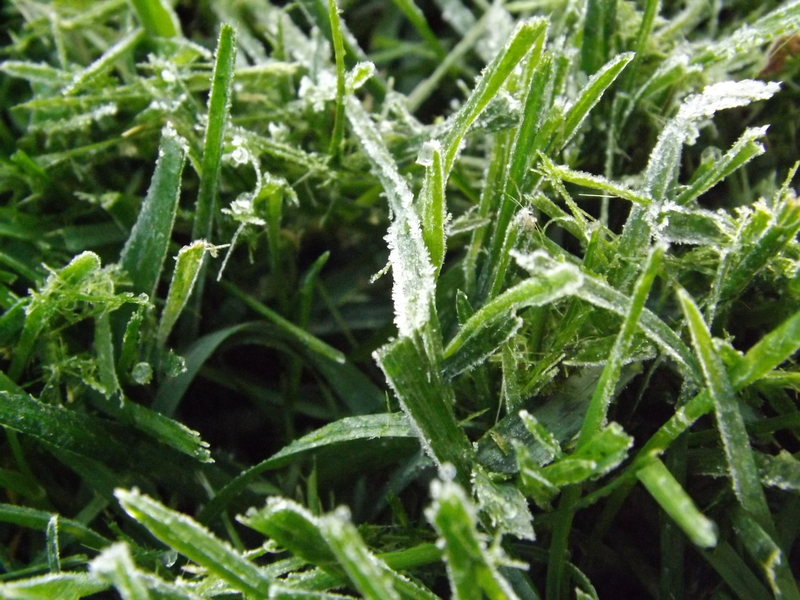 I’m keeping my fingers crossed that the seeds are deep enough not to notice the frost. 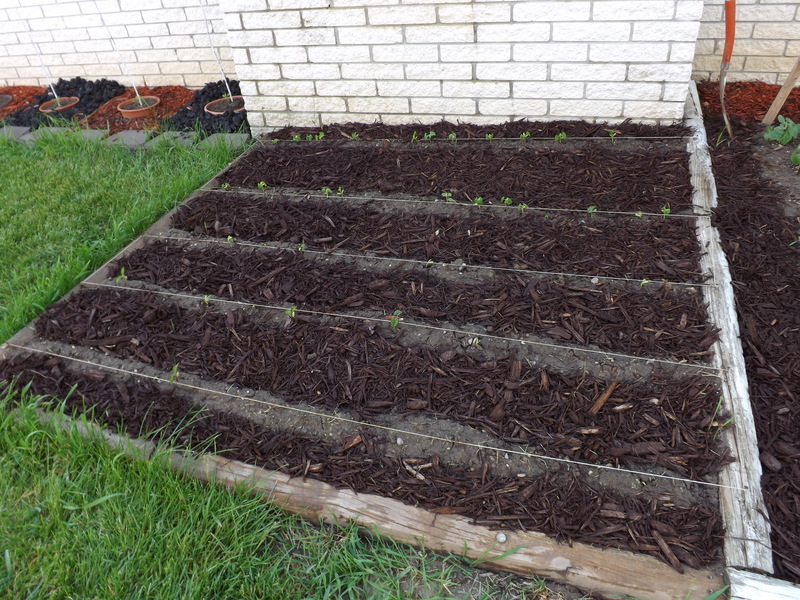 Although covering all the plants I’ve dared to plant outside already this spring is a bit time-consuming, I am very happy that so much of the garden is already in the ground. With two more areas left to plant, the greenhouse is looking empty except for the canning peppers that I don’t dare plant in the garden until the end of the month and a few extra seedlings just in case what’s been planted in the ground doesn’t make it. Michigan weather is a tricky one, but I’m prepared for it, and for this I am — Simply Grateful. One of the best things about May is that this is the month our lilac bushes bloom. Not every year, mind you, because for some reason they tend to skip a year every couple of years, forcing me to wait for them to return the following year. This year though, both our bushes bloomed. 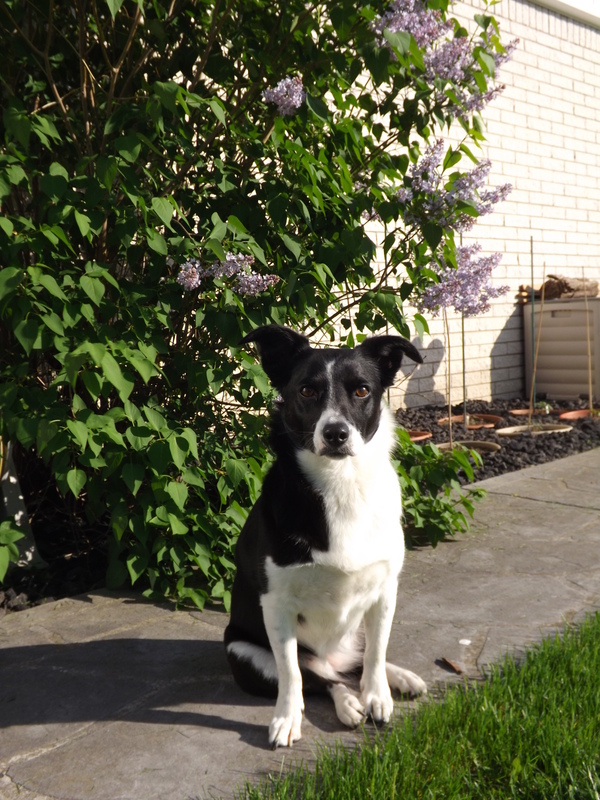 Bell loves sitting right by the lilac bush in the warm sun. I’m not sure if she too likes the smell of the lilacs or if it’s just the full sun on her back — either way, she’s enjoying something! This afternoon I cut the first two bouquets from the bushes. The bushes are loaded with partially bloomed lilacs, but I managed to find two vasefuls of fully open lilacs. One for my neighbor Karen who absolutely loves lilacs, and the other for Grace. I’m glad I cut them today because frost is predicted for tonight which might brown all the remaining. Thankfully the house will protect the ones I cut, filling the great room with the sweet scent that only comes round once a year, if I’m lucky, and for this I am — Simply Grateful.